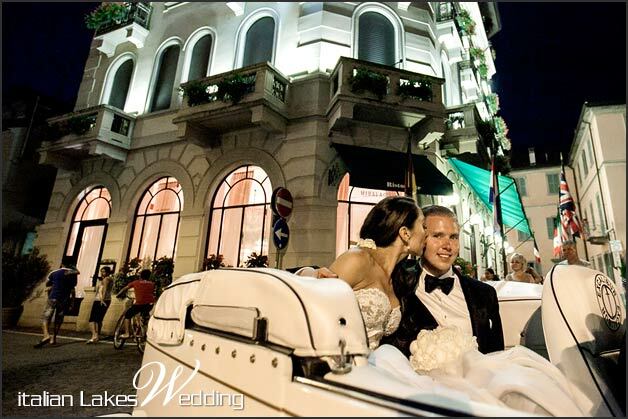 oday we would love to tell you about wonderful Margie and Ryan’s destination wedding. They are a lovely couple coming from New York. 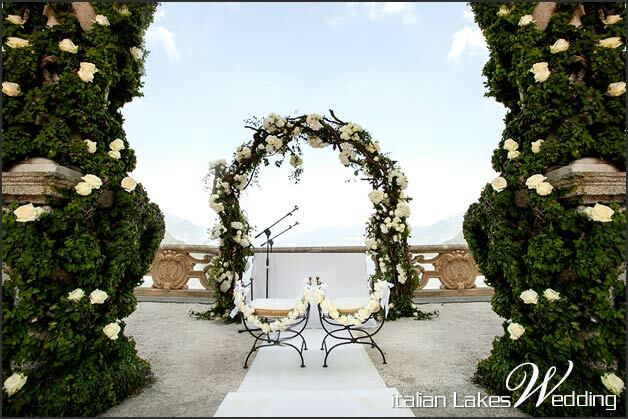 They chose Lake Como to say I do last 26th July. 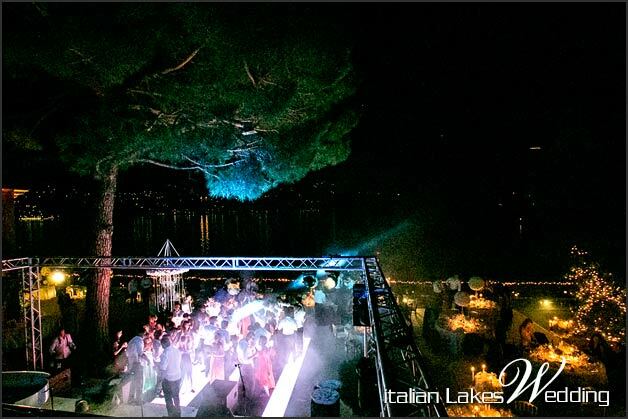 We already told you about these young lovers who spent some days on our lake shores enjoying several parties organized by our wedding planning team. 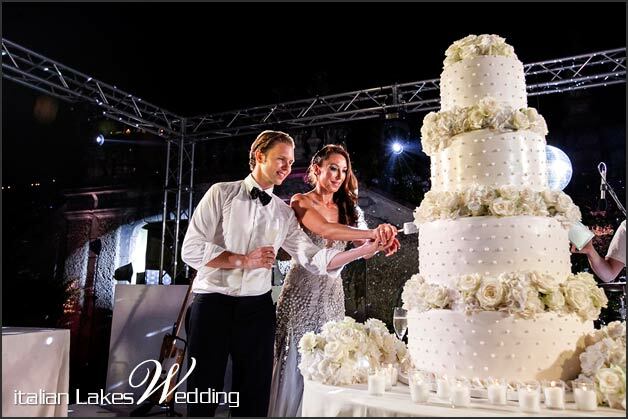 Now we want to tell you something about their wedding day: a real masterpiece of luxury and glamour! 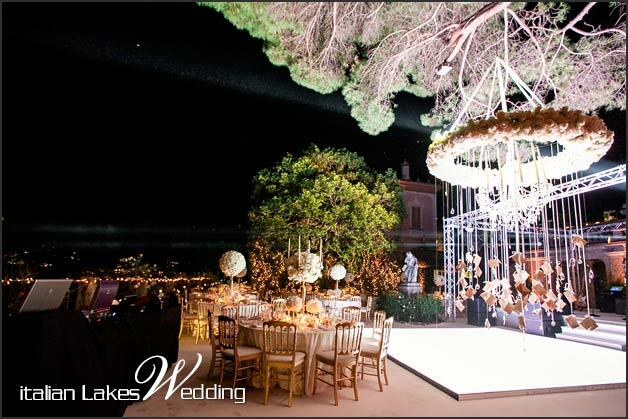 Margie and Ryan really wanted a fairytale atmosphere in every single detail for their special day. 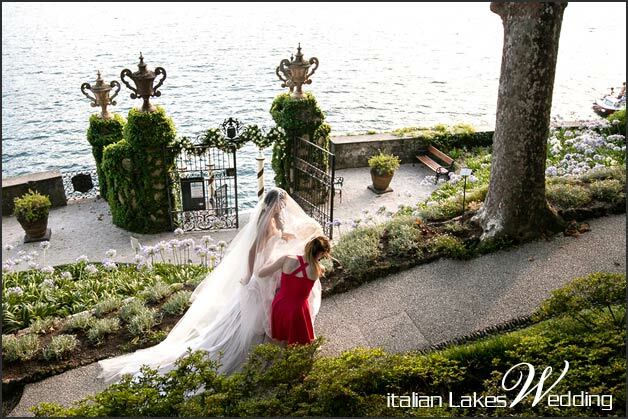 They decided to stay in a fabulous suite overlooking the lake in Tremezzo, where Margie got ready with her five bridesmaids. 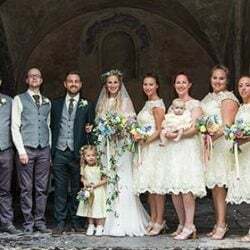 Her beauty was enhanced by a fined make up and a lovely curvy hairstyle perfectly coordinated with her precious wedding gown designed by a famous designer. 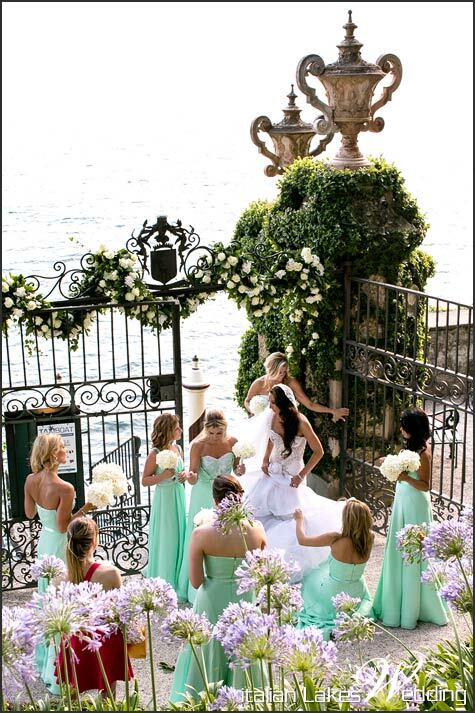 Bridesmaids wore beautiful mint-green dresses and they looked like princesses as well! What about the flowers? 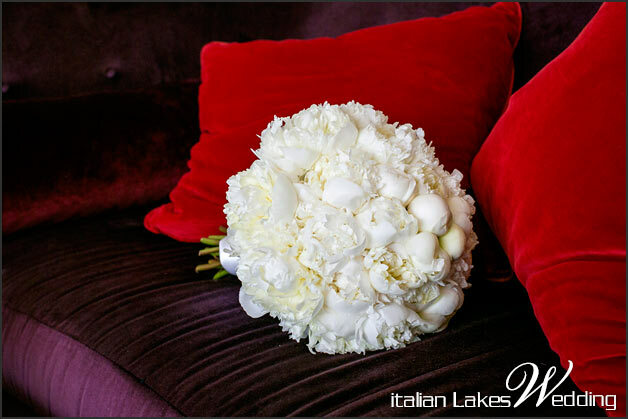 Margie chose puffy and elegant bouquets made by white roses and peonies for herself and her friends. 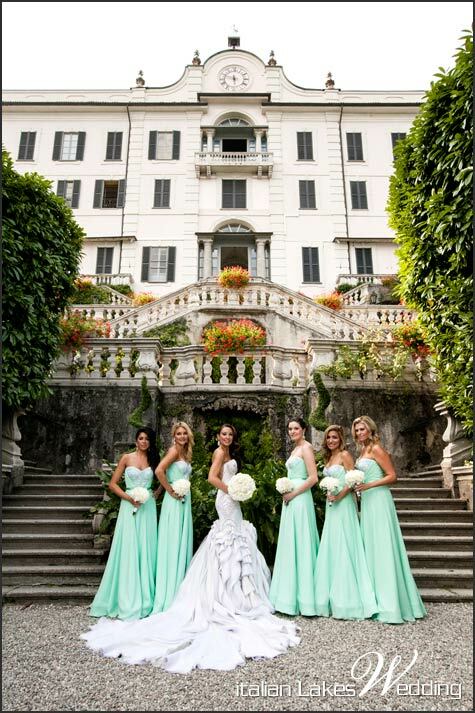 Before going to the wedding ceremony our adorable six girls had a photo session near the hotel, in amazing Villa Carlotta park. 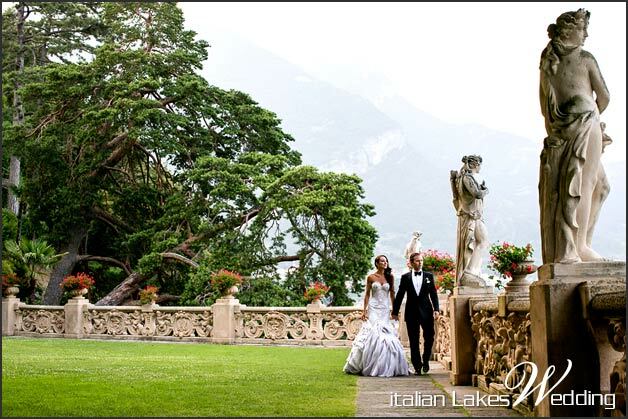 Villa del Balbianello: what a wonderful wedding set! 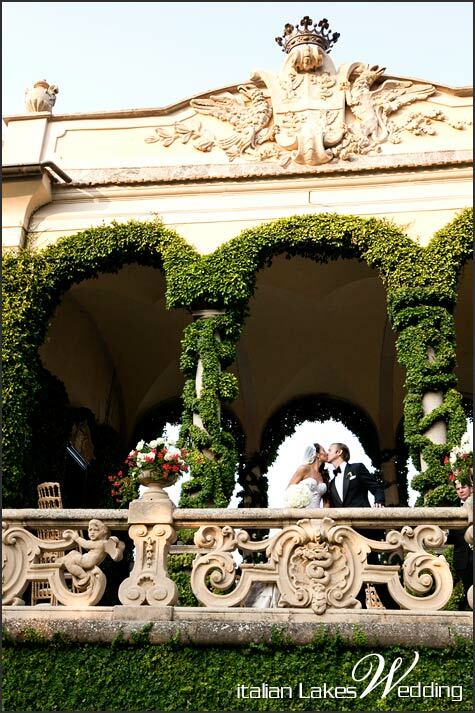 Our New York couple wanted the greatest venue on Lake Como for their ceremony: Villa del Balbianello. We organized a great welcome cocktail for all the guests on the terrace near the church. 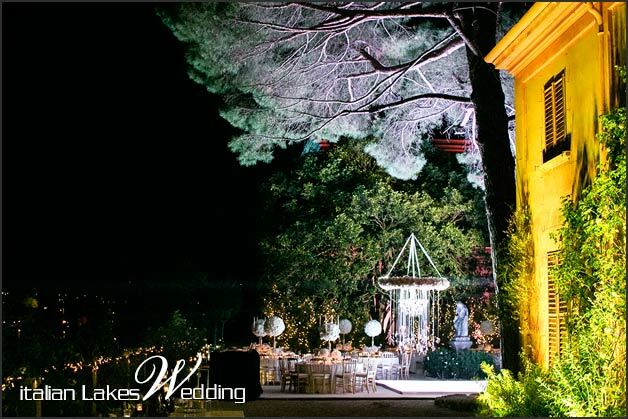 It overlooks the lake and looks over clear Italian sky. Everyone had an unexpected surprise! From a seaplane Ryan, wearing a black suit with a stylish bow tie, reached an inflatable raft waiting for him on the lake… a great arrival in perfect James Bond style! 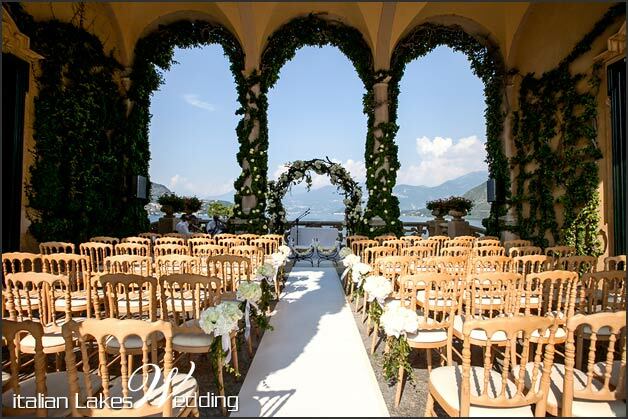 Villa del Balbianello loggia was set up in all its details: white roses and hydrangeas bouquets on chairs, white roses onto loggia colonnade and a majestic arch made by branches, ivy and bunches of white roses and peonies. 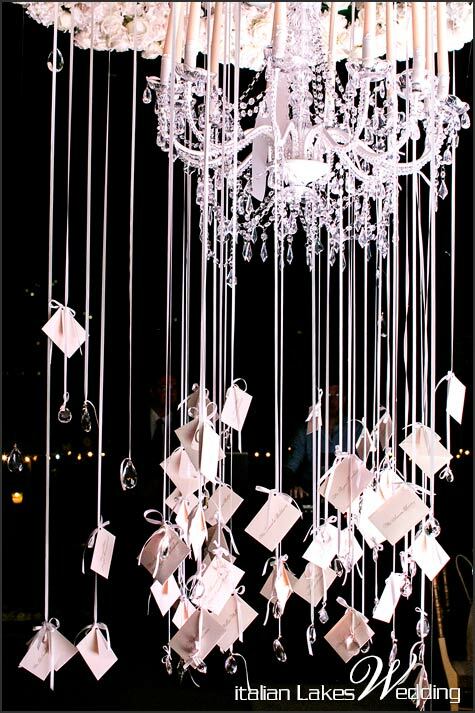 What a romantic decoration! Margie and her bridesmaids arrived by boat and left everyone without breath! 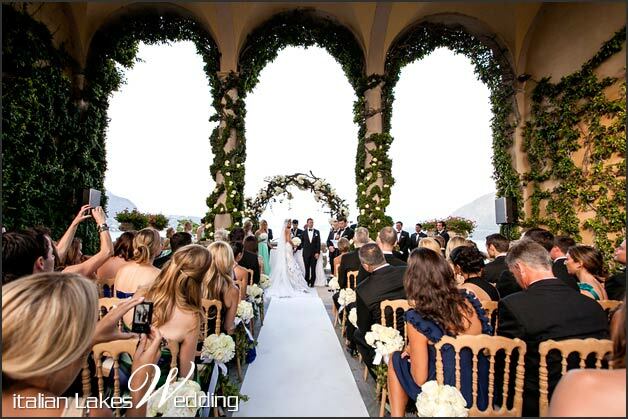 The wedding ceremony took place under the loggia in a very luxury and refined atmosphere. 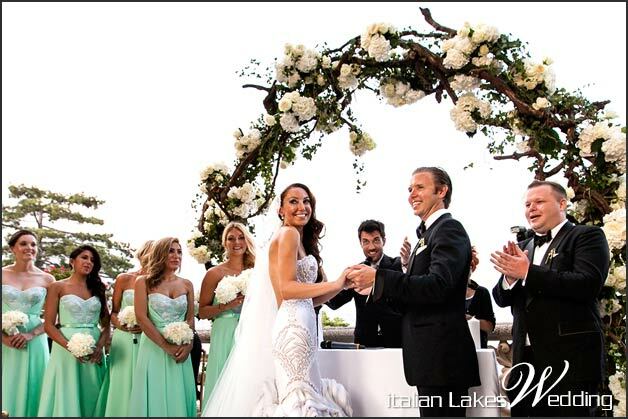 Bride and groom and all guests were really excited and touched till they said I do. 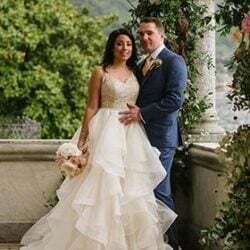 After the ceremony, everyone had the chance to enjoy Villa del Balbianello amazing park overlooking the lake and Margie and Ryan had a stylish photo session to consecrate their special moment. 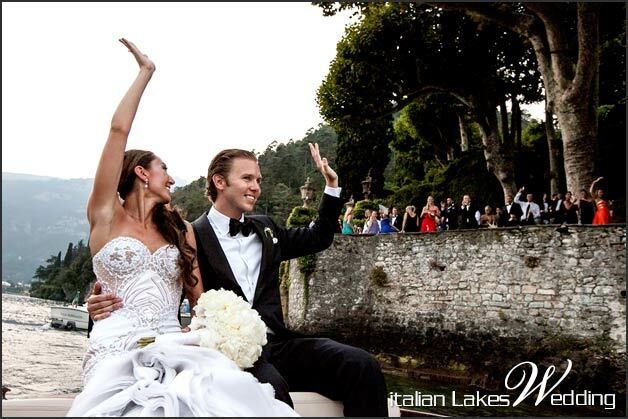 Even leaving Villa Balbianello was perfect moment for all. 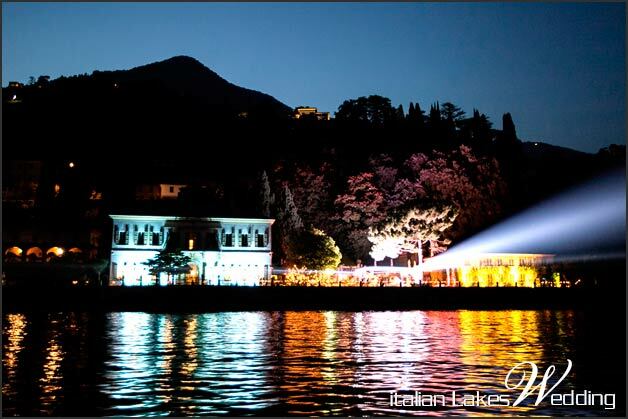 We organized some fascinating wooden taxi boats which left Villa Balbianello in a choreographic way. Margie and Ryan first and all the guests boats sailed away like a swallow tail. Wow factor was ensured! 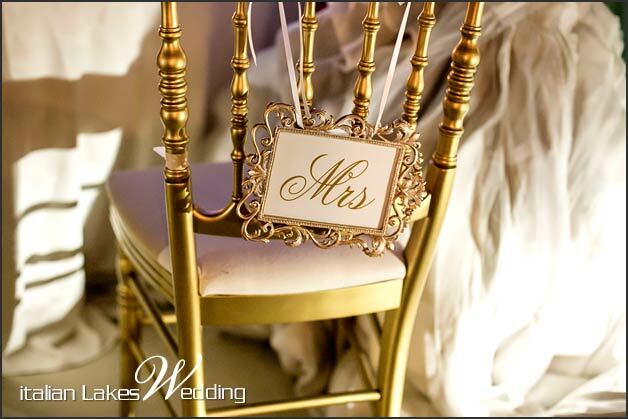 A luxury wedding day needs a glamorous reception too! 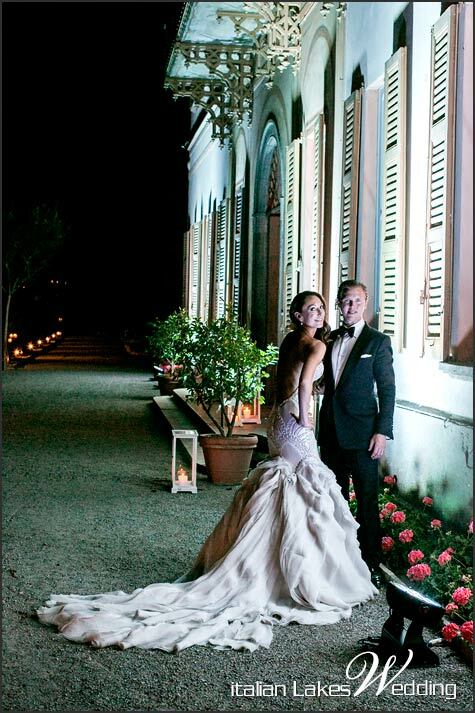 Margie and Ryan decided to hold their wedding party in a gorgeous private villa in Cernobbio. 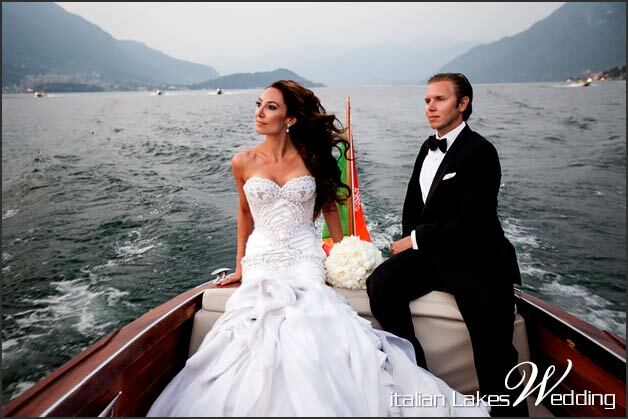 After having some pictures in Cernobbio lake shore, they reached their guest in an amazing vintage car… another surprising arrival! All their guests were waiting for them having a welcome cocktail in the villa park overlooking the lake. 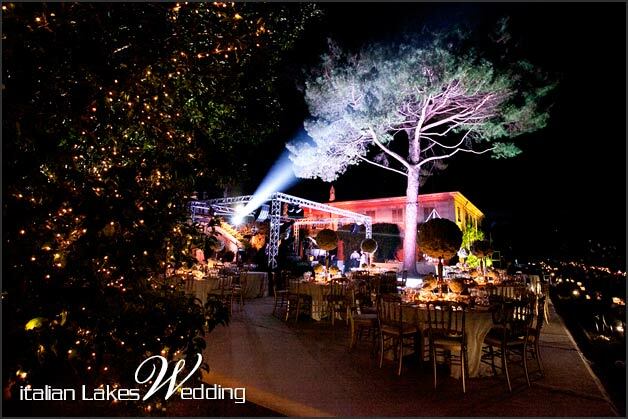 In the villa everywhere was white and gold with candles, lights onto trees and bunches, crystals and a huge stage with an lighting dancing floor. 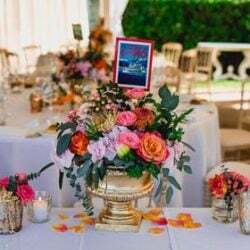 Tables were a masterpiece of elegance: gold chairs, white precious tablecloths and gold candleholders used like centerpieces with a white roses globe on the top. 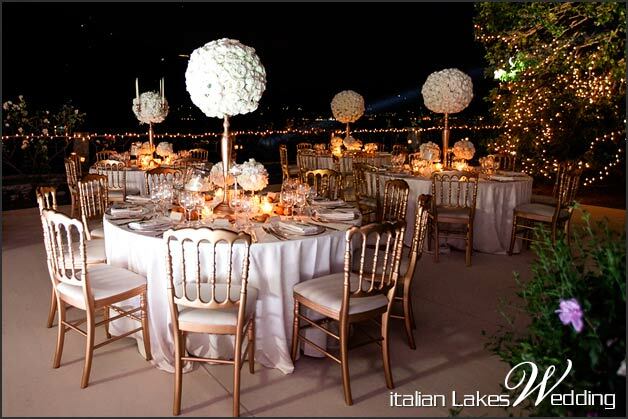 A stunning atmosphere where all guests tasted exquisite Italian dinner. 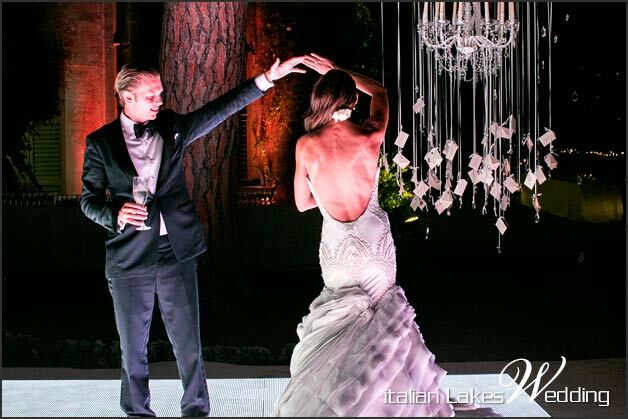 Margie changed her dress, make up and hairstyle to become the queen of the party once more and cut the cake with her husband on the stage! 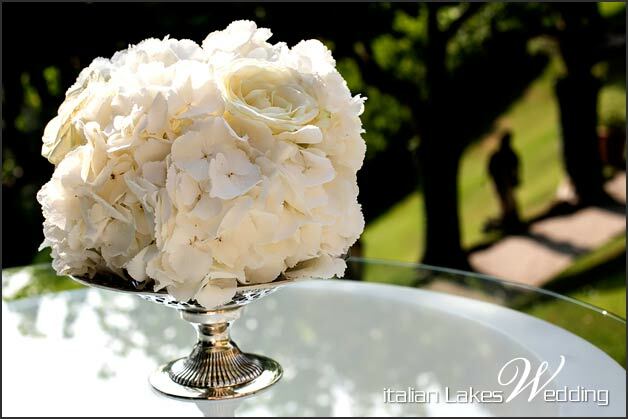 It was such an unexpected and stunning moment: a huge white four tiered cake with white peonies and roses! 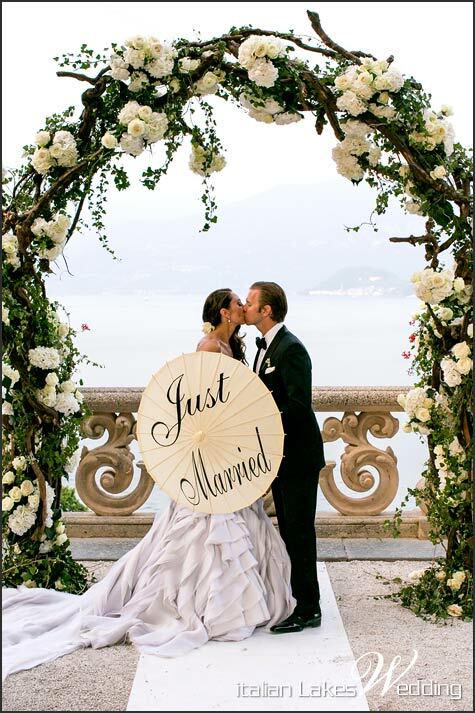 This is the story of Margie and Ryan’s destination wedding. A great experience for us too. 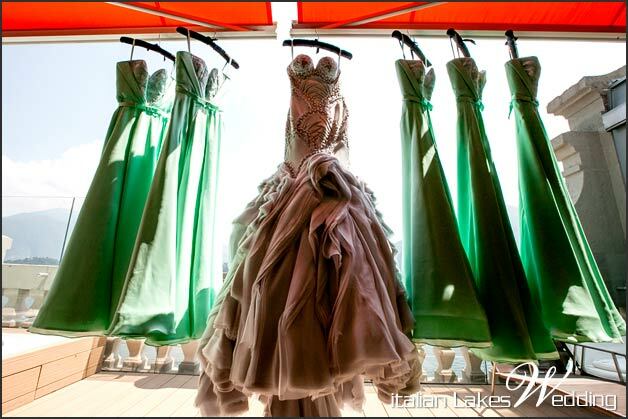 This is the story of a masterpiece of glamour and luxury and it could be your wedding story, too! 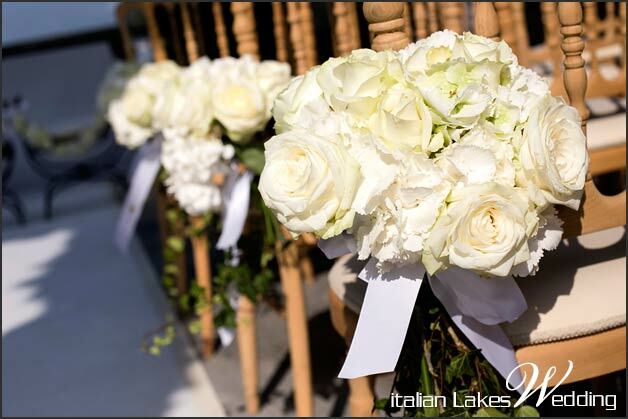 A special thanks to Studio Morlotti for lovely shots of Margie and Ryan’s wedding on Lake Como. 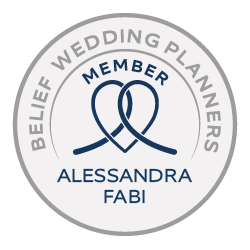 I am interested in a Wedding on a smaller scale, 50 people maximum on Lake Cuomo in 2017. We’d like dancing and great food, and amazing views as our priorities. Also, we’d love to keep the budget around 20,000 USD.